I went to my first Bioneers conference after watching from afar and reading about the organization's work for quite a few years. 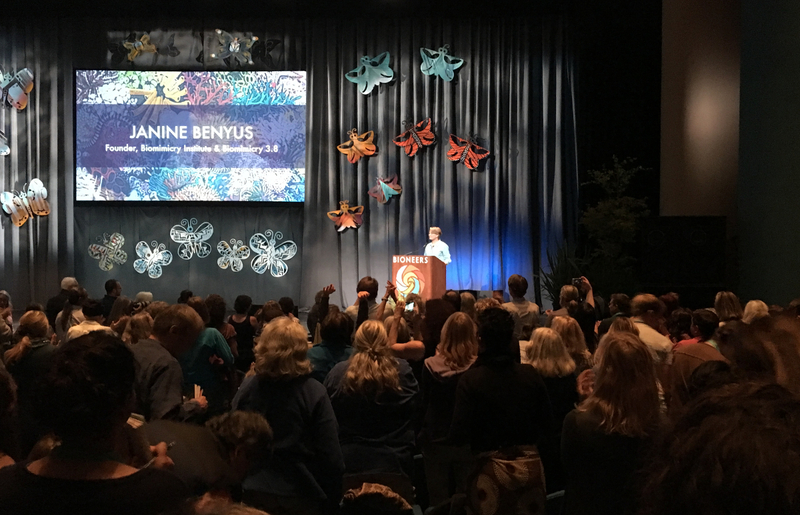 This past weekend marked the Bioneers' 27th annual event, organized by founders Kenny Ausubel and Nina Simon. I attended on Saturday, the second of the three-day conference. Don't ever ask small questions. It's not time -- yet -- to adapt to climate change. There's too much carbon in the air, but not enough in the soil. This is not a newsflash. But it points in some important directions. How so? Well, later in the day, Rebecca Burgess of Fibershed spoke, at a panel called Carbon, Climate, Food and Fiber, about five pools of carbon on our planet, through which the element can and does transition through its many mutable forms: atmosphere, biosphere, fossil, ocean, and soil. Burgess told panel attendees that a net 136 gigatons of carbon has been lost from soils since the Rotherham plow was invented in 1750 (tillage of soil contributes significantly to the one-third of human greenhouse gas emissions produced by agriculture); but at the same time pointed out that rates of carbon drawdown from the atmosphere that is possible on grassland and farmland "already under human management" could ameliorate the climate-changing levels of carbon that human activity has shifted into the atmospheric pool within five years. Achieving that drawdown would require that all grassland and farmland "under human management" be transitioned to permaculture practices, which is hard for this very junior bioneer to imagine ... but doing the arithmetic to describe the possibility as one that we as a species could choose to realize pivots attention away from paralyzed, doom-and-gloom visions of Earth's future -- and shines a bright light on our responsibility as a species to choose well and consequentially at a crucial moment in our biosphere's history. Bren Smith, the founder of GreenWave spoke during the morning plenary session on Saturday, as well as on a panel that afternoon titled Reshaping Our Relationship to the Ocean. Smith speaks in a genially-calculated voice that puts his working class, Newfoundland fisherman origins front and center: "I'm not an environmentalist," he said to an auditorium full of environmentalists. "Give me a gun and I'll shoot moose from my kitchen ... I grew up on seal hunts." But the fact that he's doing heroic environmentalist work became clear when he described his "vertical farms," suspended from buoys off the Atlantic coast of North America. GreenWave's farms produce kelp and other seaweeds ("It's embarrassing to grow vegetables...," Smith moaned with a wink) as well as bivalves including mussels, clams, and oysters with no inputs (fresh water, fertilizer, etc.). After 15 years of experimentation, we have developed a new method of ocean farming designed to restore ocean ecosystems, mitigate climate change, and create blue-green jobs for fishermen — while providing healthy, local food for communities. If chefs can't make what we grow delicious, they should quit their jobs ... it's what they're here on earth to do. As a former professional cook myself, I can get behind that sentiment. "when we started, nobody really thought we would win ... victory is that now everything gets fought ... fossil fuel resistance is everywhere." Not least, of course, in North Dakota at the Standing Rock protests against construction of the "Dakota Access Pipeline" (DAPL) ongoing today, which weighed heavily on this weekend's conference crowd. Once again, the Bioneers' signature insistence: that we can win this. I was encouraged in that vein to find (in the conference's Exhibit Hall ) a display put together by fifth graders from the Helios School in Sunnyvale that collected artifacts of environmental campaigns that the students studied in the course of considering work they would need to do as they grow into adult responsibility (that is, responsibility for the screw-ups we adults are bequeathing them). Raphael, one of the fifth graders, was happy to learn that I had participated in the No Coal in Oakland campaign, which was one of the subjects of his class's research. 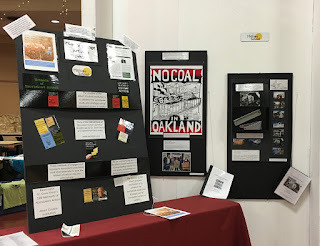 He knew about Mayor Libby Schaaf's role in opposing transport of coal through Oakland, and in the course of our conversation we realized that both of us participated in the rally earlier this year that preceded the Oakland City Council's vote to ban coal transport through the city and port. What the world needs now is more ten year old environmentalists like Raphael and his classmates! We're all active agents in our environment. That's the core of what Bioneers are about. Active agency, the heart of what it's going to take for humanity to dig its way out of the mess we've made of our biosphere. 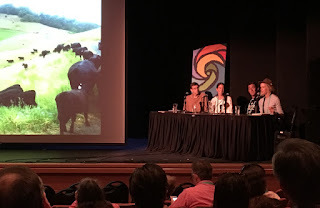 Images (from the top of this post) include: Janine Benyus speaking at the Saturday morning plenary session of the Bioneers 2016 conference; Rebecca Burgess and Ariel Greenwood, with John Roulac and Guido Frosini, on the Carbon, Climate, Food and Fiber panel on Saturday afternoon; and a portion of the Helios School exhibit of artifacts from recent environmental movements and campaigns. This blog was originally posted on Medium. I was surprised and gratified to see Michael Pollan’s piece in yesterday’s New York Times: Big Food Strikes Back: Why Did the Obamas Fail to Take On Corporate Agriculture? Why surprised? Because so much of what passes for political reporting in this election season is undermined by boorishness, hypocrisy, dog-whistling, race-baiting, and misogyny; whereas Pollan’s essay is carefully developed, illuminating, and actually useful to those who seek to responsibly understand and influence humankind’s shared-fate future. Pollan is playing the long game. Yesterday’s essay follows-up on an open letter of similar length and depth published eight years ago, a month before the election that sent Barack Obama to the White House. The NYT titled the open letter Farmer-in-Chief, and addressed it to the President-Elect. Yesterday’s essay is a disappointed but clear-eyed assessment of how and why President Obama failed to take Pollan’s 2008 advice nearly far enough. It wasn’t because the President-Elect didn’t get it. I was interviewed a few days ago by Joanna Manqueros on her “Music of the World” program on KPFA, a public radio station broadcasting from studios in Berkeley, not far from where I work. Joanna read a passage from Consequence, and we discussed how the passage she read from addresses the complexity of communicating the essentials of agricultural politics and policy — complexity that led Michael Pollan to write 8,000 words in 2008 on the topic, and nearly 6,000 more yesterday in follow-up and reassessment. Christopher watched out the window as they accelerated onto Highway 101 and sped south, following a steady march of telephone wires strung atop pocked wooden poles. He tried to visualize the surrounding acres as wetland, teeming with wildlife in the centuries before the state was logged, drained, burned, and given over to cattle and monocropping. At least the farms were smaller here, he thought. And a lot more of them grew organic than in the Central Valley. It was a start. Steve: Well, Chris is — letting go of exactly what’s happening in the plot there — Chris is driving through … I guess it would be Sonoma County at that point … and looking at the small farms there. And what he’s observing, if you’d read a little bit further, is that really there’s nothing obvious about these small farms, that they tend more toward organic, and that they tend less toward monocrop — although I suppose you can see that it’s not the same plant for acres and acres and acres on end, as you would see, say, if you drove through, Nebraska, where corn or soy are pretty much your only choices. But one of the things he’s reflecting on is how difficult it is to convey in a dramatic way, in a way that penetrates the teleconsciousness of the nation, that penetrates the chatter of the news cycle, to talk about the kind of long term and deep problems that evolve in environments that are monocropped, or where pesticide is leached out of soil into aquifer or into water that feeds cities. You don’t see that right away. There’s not a Michael Moore moment that you can film, or dramatize in a demonstration, in some kind of guerilla theater. And so he’s reflecting — Christopher is more than anything else a propagandist. He’s been asked to write a manifesto to justify this vaguely-defined — to him — action that Chagall is going to take. And he’s thinking about how hard it is to vividly explain to people what’s wrong with monocropping, what’s wrong with putting genetically engineered creatures into an evolved biosphere that has taken, literally, hundreds of millions of years to come to its equilibrium. There might be science, politics, and policy that can still avert the most horrific effects of the accelerated poisoning that humans have inflicted on our biosphere over the last couple of centuries. Pollan lays out some key, deeply intertwined threads of the answers we need to be looking for in his paired essays’ 14,000 words. Consequence depicts characters engaged across a spectrum of diverse approaches to correcting our species’ broken trajectory, tactics that range from reasoned dissent to all-out disruption or even destruction. From where I sit, humankind would do well to wrap our collective minds around the objectives laid out by Pollan, and the paths he suggests toward turning ourselves in constructive directions; and likewise would benefit from explorations of actively-engaged characters, hearts, and moral frameworks that could move us to grapple with the enormity of threats to our common future. 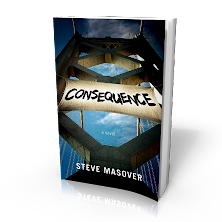 I hope that readers find in Consequence an example of such an exploration — one among many. 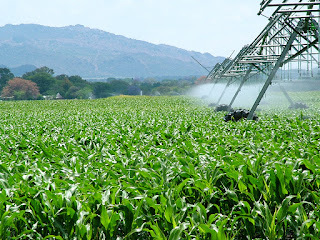 Thanks to Lotus Head from Johannesburg, Gauteng, South Africa for his image Cornfield in South Africa — sxc.hu, CC BY-SA 3.0 (via Wikimedia). This post was originally published on Medium, under the title Michael Pollan, Michael Moore Moments, and Humankind’s Future.